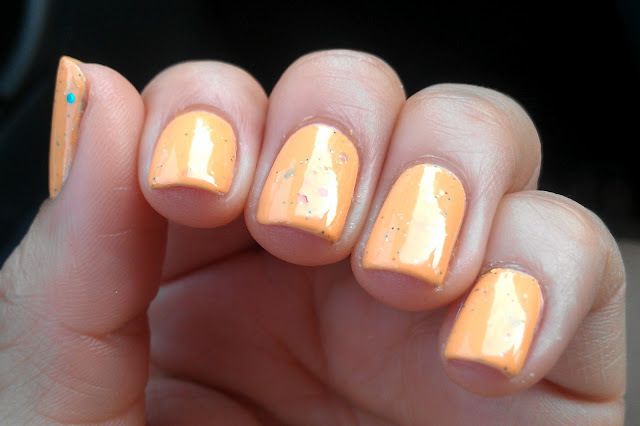 Today I will be showing you a polish from the Fierce Frankens Fun in the Sun Collection, which you can find HERE. This is Rainbow Sherbert described as "A light orange with multicolored small hexagonal and micro glitters"
I used 2 coats here, it is very well pigmented you can probably get away with 1! Great coverage for a lighter shade. 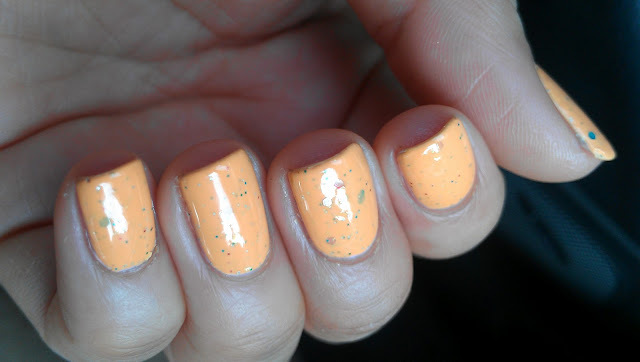 I'm loving all things orange so yeah I love this mani! It looks especially beautiful on the first photo! aww this is such a fun color! :) love it! I like this color. Not to bright but perfect for spring/summer. Dude that's really pretty! I love it! This is such a cute combo!! Perfect for spring! Nom!!! I want to eat it too. So gorgeous! So cute! It looks exactly like sherbert. Delicious looking! I love this! Looks just like rainbow sherbet so pretty and yummy looking! Great job! I love it on you!!! Now I want sherbert again, lol!! This is gorgeous!! I'm not a big fan of orange, but I LOVE this!! This is such a lovely sherbet color!! Dolish Polish - Putting on the Ritzzz! Just wanted to say Thank You!!! !